While other states have so far resisted the temptation to mandate ethanol use, the Federal Government is considering phasing out or upgrading regular unleaded. "Motorists are not getting a cost saving with E10 compared to regular unleaded because it has less energy density," says Natalie Roberts, an independent vehicle emissions expert whose company ABMARC does real world fuel-economy testing. "In other words you need to burn more E10 to travel the same distance as a car running on regular unleaded." Roberts says the latest data shows motorists in NSW have been forced into buying dearer, premium unleaded. "The idea behind E10 was to make petrol more affordable but if you look at the long term average it's not cheap enough compared to regular unleaded," says Roberts. "E10 has also had the unintended effect of pushing motorists into premium fuels which means they're paying even more every time they fill up." 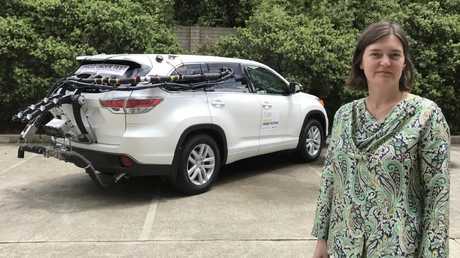 Vehicle emissions expert Natalie Roberts with a Toyota Kluger fitted with test equipment that measures fuel economy and emissions on public roads, rather than in a laboratory. Picture: Joshua Dowling. NSW now has the highest consumption of premium fuel, representing 42.3 per cent of all unleaded sold in 2016-2017. The average consumption of premium fuel for the rest of Australia over the same period is 25 per cent. Emissions experts say E10 doesn't make financial sense unless it is at least 4 cents per litre cheaper than regular unleaded. Long term averages show the price gap is usually about 2 cents per litre. Despite this, the NSW Government last year mandated 60 per cent of all unleaded fuel sold at service stations must be E10. At the same time the Queensland Government mandated E10 must account for 30 per cent of unleaded sold at the pumps. Next month, Queensland will increase the E10 mandate to 40 per cent of all unleaded fuel sold by retailers. Petrol stations in both states aren't hitting these ambitious targets but nor are they being fined. Figures from the Department of the Environment and Energy show demand for E10 fuel represents just 2.4 per cent of unleaded petrol sales outside NSW and Queensland. In NSW the consumption of E10 is more than 11 times the average for the rest of Australia, making up 27.3 per cent of all unleaded sold - according to figures from the 2016-2017 financial year - but still less than half the 60 per cent mandated. In Queensland in the first four months of this year E10 fuel accounts for 17 per cent of all unleaded sold - just over half the current 30 per cent target but less than half the 40 per cent mandate due to be enforced from July. 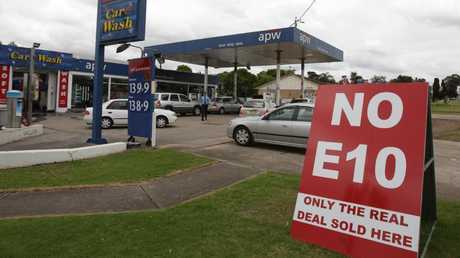 Not every petrol retailer was a fan of E10. This file photo from 2011 shows one outlet in western Sydney responding to customer backlash against the fuel. Picture: Jeff Herbert. The total environmental benefit of E10 is variable, Roberts says, once you take into account the ecological impact of feedstock, fertilisers, farm machinery and production processes. "The well-to-wheel environmental benefit of using ethanol-blended fuel is yet to be determined. Depending on how it's produced it could be worse for the environment than if regular unleaded fuel were being used," said Roberts. As part of a review into Australia's fuel quality, the Federal Government is considering whether regular unleaded should be further refined to meet modern international standards. 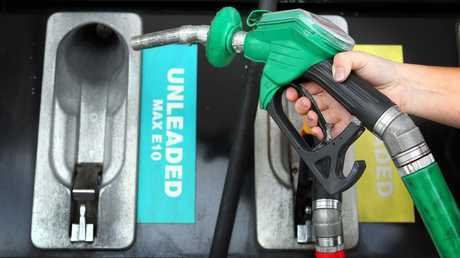 The petrol lobby says we can have cleaner fuel but it'll cost more at the pump. Car companies say their most efficient engines won't run on our "dirty" fuel, which ranks outside the Top 50 countries in the world. Australia's regular unleaded is currently allowed to have 150 parts per million of sulphur; world's best practice is 10 ppm. In the middle of this debate ethanol-blended fuel continues to be touted as an alternative. However, independent tests have repeatedly proven beyond doubt E10 doesn't last the same distance as regular unleaded. At freeway speeds E10 is up to 4 per cent less efficient but in city and suburban driving consumption can be up to 7 per cent higher than a car running on regular unleaded. Decisions, decisions … the federal government is weighing up whether to leave regular unleaded alone or upgrade it to meet modern international standards. Picture: Nic Gibson. So why do we even have E10 as an alternative? Manildra, the biggest producer of ethanol in Australia, began lobbying state and federal governments in the early 2000s. The controversial fuel was eventually introduced in NSW in 2007 by Labor Premier Morris Iemma, who described it as a "win for the hip pocket when it comes to fuel costs for families". Manildra has reportedly donated more than $4.3 million to the Liberal Party, Labor and the Nationals since 1998, according to figures provided by Jeremy Buckingham from the NSW Greens. "This is decisions for donations and it absolutely stinks," Buckingham told ABC Radio in 2016, the same year the NSW Government announced it would spend $4.5 million taxpayer dollars on an advertising campaign trying to increase demand for E10. Even some Liberal Party politicians have retreated from the E10 push. Speaking out against the proposal to fine service station owners for not hitting their mandated E10 targets, Dr Peter Phelps, NSW Liberal Party Upper House MP said in March 2016: "Put simply, this bill criminalises service station owners for the legal purchase decisions of their customers". 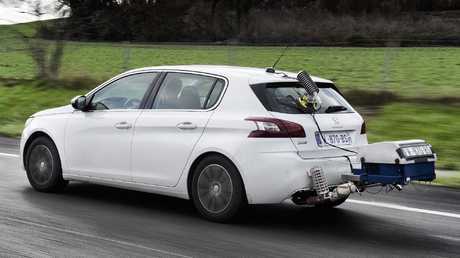 Manufacturers in Europe have already begun testing the economy and emissions of their cars using mobile diagnostics equipment such as the device fitted to this Peugeot. Picture: Supplied. When News Corp Australia asked the Department of Environment and Energy how the review into Australia's fuel quality was progressing, they said a decision is yet to be made. "The draft (regulatory impact statement) canvassed three policy options for updating Australia's fuel standards to make sure Australians have access to high quality fuels" the department said. "Only one of the policy options, Option B, proposed phasing out regular unleaded petrol. Of the options presented, this was the only one that did not deliver a net benefit to the community." The statement added: "No changes were proposed to ethanol in petrol". The department said the three options in the draft proposals "are not government policy and no decisions have been taken".